Sydney (PTI): Newly-crowned Indonesia Open winner Kidambi Srikanth continued his rampaging run to advance to the men’s singles semifinals but it was curtains for PV Sindhu and Saina Nehwal at the Australian Super Series here on Friday. In the all-Indian quarterfinal duel between Srikanth and B Sai Praneeth, it was the former who came out on top with a fighting 25-23 21-17 win over his countryman in a 43-minute clash at the Sydney Olympic park. It was the second time that the two Indians were facing each other. They had squared off at the finals of Singapore Open where Praneeth had the last laugh. Srikanth, who had edged out world no.1 Son Wan Ho in semifinals en route his title triumph at the Indonesia Open last week, will face fourth seed and All England finalist Yuqi Shi of China in the last four round. World No.11 Srikanth had beaten Shi Yuqi, winner of the 2016 French Super Series, at the Singapore Open this year. However, disappointment was in store for India in the women’s singles as Rio Olympics silver-medallist Sindhu and defending champion Saina squandered opportunities galore to go down in thrilling three-game matches. Sindhu failed to get the better of world No.1 and top seed Tai Tzu Ying of the Chinese Taipei for the seventh time in her career, while Saina fought for an hour and 19 minutes before losing to last year’s finalist Sun Yu. Sindhu squandered a game’s advantage to go down 21-10 20 -22 16-21 in a contest that lasted exactly an hour, while Saina went down 17-21 21-10 17-21 to Sun. Earlier, in a match between two friends, it was Praneeth who took early lead, moving to a 4-1 advantage and despite Srikanth grabbing a slender 11-10 lead at the break, the Thailand Open champion once again moved to a 16-13 lead. 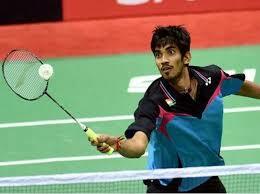 Srikanth then reeled off five straight points to turn the tables and moved to a 20-17 lead. Praneeth grabbed four straight points to hold a game’s advantage but the 2014 India Open champion ensured he had the last laugh. In the second game, Praneeth again had a 4-1 lead but Srikanth once again surpassed him to grab a 11-9 advantage. Praneeth narrowed the gap to 12-13, before Srikanth zoomed ahead to seal the match. In the women’s singles match, Sindhu dished out a brilliant show in the first game after initially fighting to a 8-7 lead. She reeled off five straight points to move to 13-7, before producing a seven-point blast to seal the game. In the second game, Sindhu once again had a 11-8 lead but Tai Tzu grabbed the advantage at 16-13. The Indian erased the deficit to held the match point at 20-19 but the Chinese Taipei shuttler sealed it with two good points. In the decider, Sindhu squandered a 8-4 and 14-10 lead to eventually go down to the World No. 1. 43-minute clash at the Sydney Olympic park.